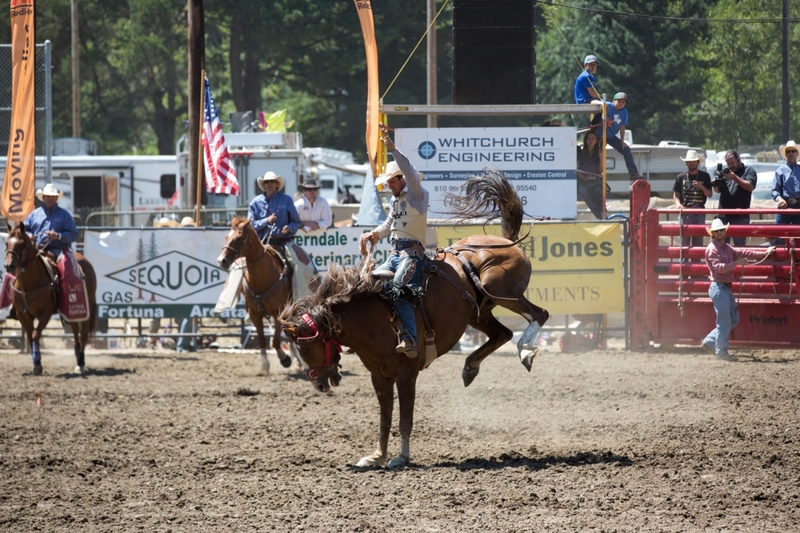 THE RODEO STARTS AT 2PM SATURDAY JULY 20th, sponsored by Bear River Casino Resort! This fast-paced event is the purest test of a cowgirl's lasso skills. As in steer wrestling, a calf leaves the shute at a run and after a head start trips the barrier holding back the cowgirl. The contestant then gives chase and attemps to lasso the calf's head. She has the rope tied to her saddle horn with a string and halts her horse. Time is called when the calf, which is still running, breaks the string. Tie-down roping was derived from the practical method cowboys use to gather cattle for medical treatments or branding. The pursuit doesn’t begin until the calf reaches its head start and triggers a trip lever releasing the barrier in front of the roper's chute. In seconds, the roper and horse will go from standstill to full-tilt gallop, racing after the calf and against the clock. Once in position, the rider ropes the calf, dismounts and runs to it. Meanwhile, the horse is trained to continually move backward to maintain tension on the rope. The cowboy then flanks the calf to its side, and with the use of a pigging string, ties up any 3 of the calf’s legs. The clock stops when the cowboy throws both hands in the air. The cowboy then remounts his horse and rides forward, the calf must remain tied for six seconds. A 10 second penalty is added to that time if the cowboy and his horse break the barrier, which can be costly, where contestants are separated by fractions of a second. Two riders on horseback are positioned on either side of the roping chute in preparation for the wild chase. After the steer gains a head start, the first roper, known as the header, must rope the steer in one of three ways: around both horns, around one horn and the head, or around the neck. If the header ropes the steer in any other fashion, then the team is disqualified. After the header ropes the steer and quickly dallies his lasso, he must quickly turn the steer to the left to set up his partner, the heeler. 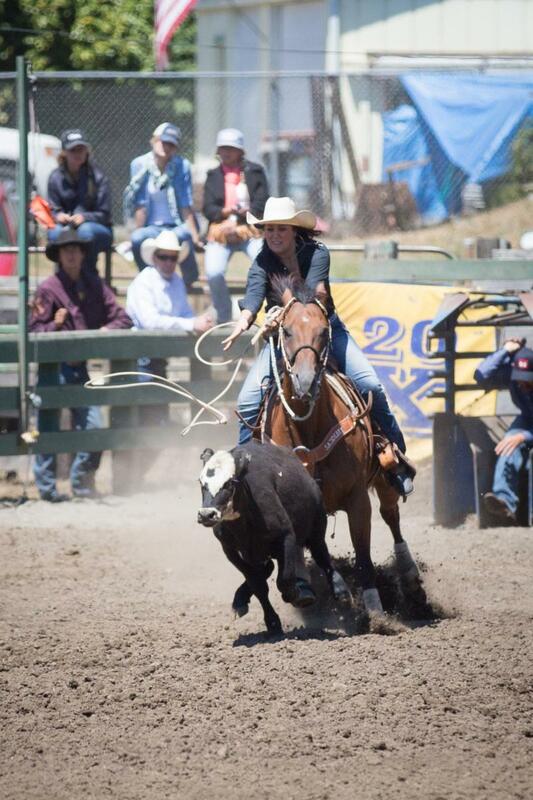 The heeler’s task is to lasso both of the steer’s hind legs; time is called when both horses turn to face each other with no slack in the ropes holding the steer. 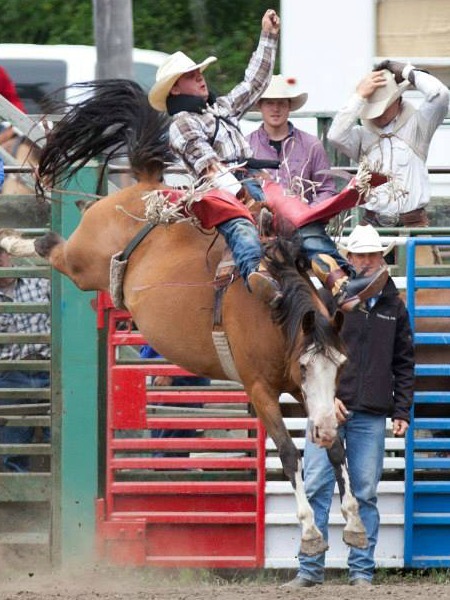 The riders are penalized 10 seconds if the header leaves the chute too soon and five seconds if the heeler only ropes one hind leg. Rodeo’s classic event, saddle bronc riding, evolved from the Old West when gritty cowboys fought to tame nature by breaking and training wild horses for their cattle ranches. 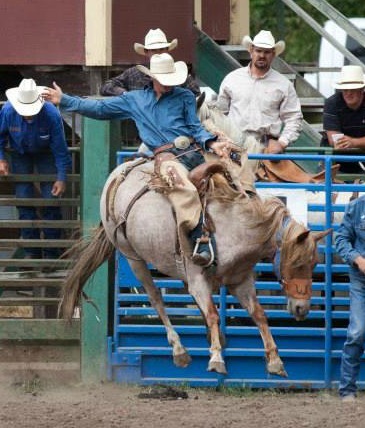 A rider can easily receive a “No Score” for simply missing his “mark out,” which requires both heels to touch the horse’s shoulders on the first jump out of the chute. The rider also can be disqualified if he touches any part of the horse or his body with his free hand at any time during his ride. For eight seconds, the dirt arena becomes a dance floor as the rider uses strength and agility to spur in rhythm with the horse's bucking motion. To garner the best score, a cowboy must keep his toes turned outward, spur consistently from shoulder to saddle, and maintain balance and control of the horse. The horse's bucking action also is judged and calculated into the overall score. The Cowboy is judged 0-50 pts on his mechanics and the horse is judged 0-50 on its wildness and ability to buck. 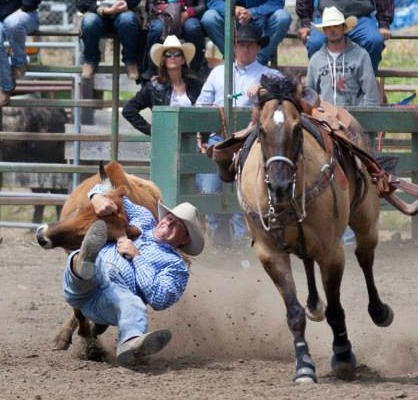 In steer wrestling, a cowboy uses only his strength and skills to tackle a runaway steer at least twice his size and weight. Steer wrestling is the fastest rodeo event, with a world record of 2.4 seconds The steer wrestler starts behind the barrier on one side of the steer, which is waiting to run in the chute, while a second cowboy on horseback, called a “hazer”, waits on the opposite side. The hazer acts like a barrier preventing the steer from veering away from the bulldogger after it leaves the chute. Once the steer is given a head start, the bulldogger and hazer take off blocking either side of the 500-pound animal. The bulldogger slides off his horse, wraps his arms around the steer’s horns and uses his whole body and strength to flip the steer on its side with all four legs pointing in the same direction. If the cowboy breaks the barrier too soon, he receives a 10 second penalty. This all-women’s rodeo event is a display of fine horsemanship as the rider and horse maneuver through a course racing against the clock. 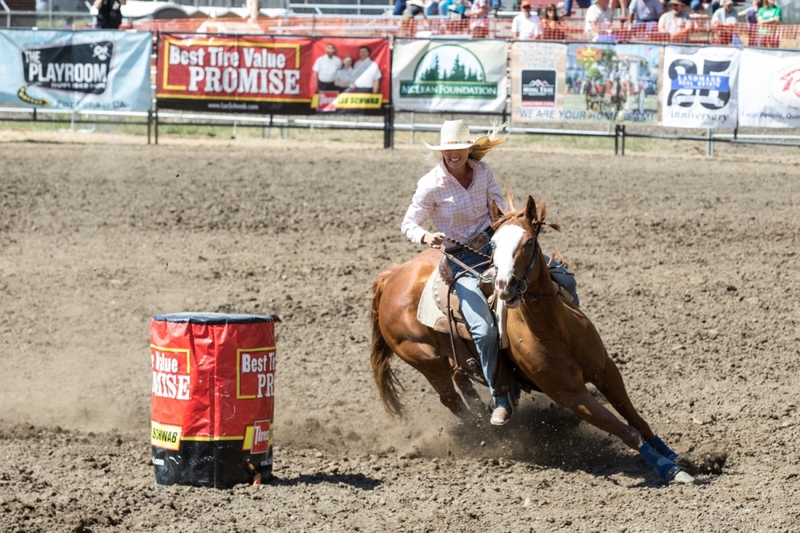 Timing is truly everything in barrel racing as a contestant’s run is measured in hundredths of a second. Entering the arena at full speed, the horse and rider race to complete a cloverleaf pattern around three barrels in a triangle formation before exiting through the entrance. 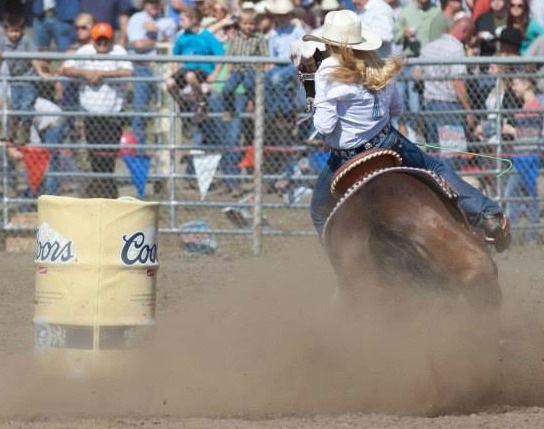 Dirt flies as the horse and rider try to “hug the barrels” as close as possible to remove seconds from their time. The rider must be accurate or else they risk knocking over a barrel and adding a penalty of five precious seconds to their total time. 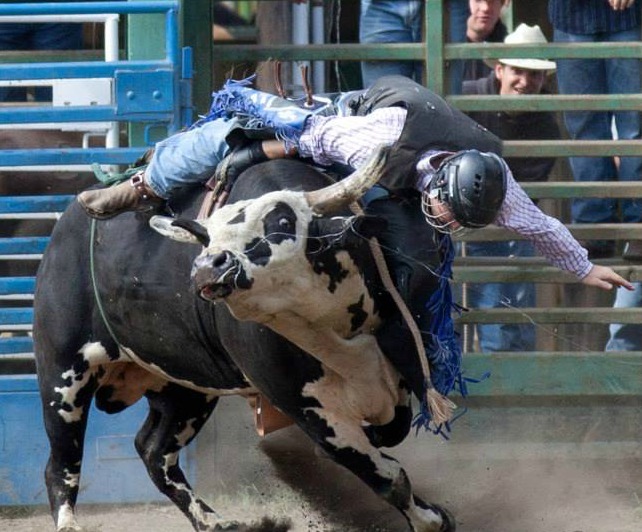 Bull riding is often considered the most dangerous sport in rodeo. While most rodeo events evolved from ranch hand practices, bull riding started from the fearless, wild character of cowboys brave enough to ride nature’s horned beast. The fate of the ride is in the cowboy’s own hand as he grips on to the bull rope. A bull rope is a flat-braided rope with a single hand-hold wrapped around the bull’s chest and held fast by the cowboy’s riding hand. A bull rider can be disqualified for touching the bull or himself with his free hand during the ride. A bull rider’s challenge is an eight second ride; however time isn’t the only factor in the score. 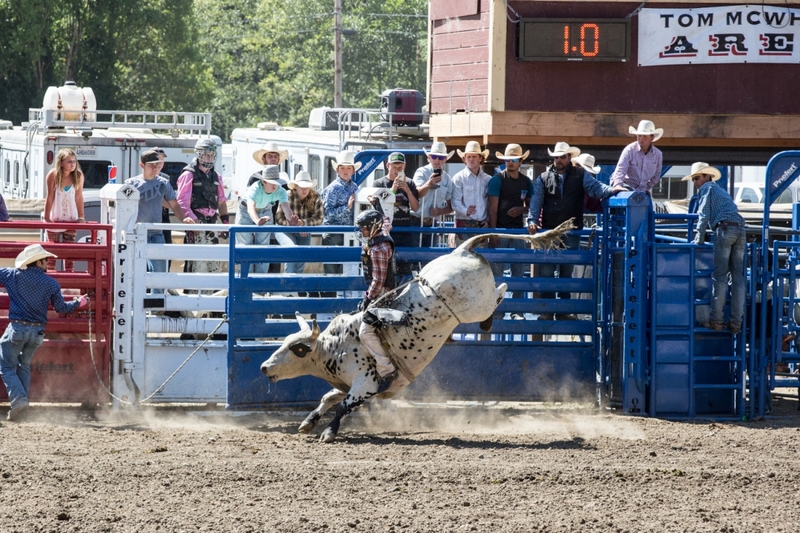 As in all rough stock events, the bull’s bucking efforts account for half of the rider’s points. Each bull is unpredictable, dangerous and specific in its own bucking fashion. Some bulls spin continuously in a circle, or jerk side to side, and even jump in the air relentlessly kicking.